Child-friendly? The third installment in the Ice Age movie franchise gives viewers something new: 3-D. While exciting, some of scary scenes involving dinosaurs may prove to be a bit troublesome for younger audiences. However, those scenes are balanced with the comfort of familiar characters returning to the screen as well as cartoon comedy. There are some insults in the film using mildly vulgar words. The movie is probably appropriate for children aged 6 and up. The herd is back and this time they’ve uncovered some new friends. 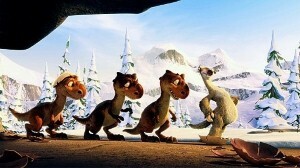 Ice Age 3: Dawn of the Dinosaurs reunites the characters from the previous films and follows them as they discover a new world with much larger beasts roaming around. In this film, the wooly mammoths Manny and Ellie (Ray Romano and Queen Latifah respectively) are now expecting their first child, which is in contrast to Diego, the sabre-toothed tiger (Denis Leary) who is anxious for a new adventure. He gets his wish thanks to Sid, the sloth (John Leguizamo), who finds abandoned eggs under the ice that are revealed to belong to a Tyrannosaurus Rex. The dinosaur eventually takes her kids back and, along with Sid, returns to an underground world where dinosaurs roam free. This sets the stage for the herd to band together in a rescue mission, taking them to a new world in a new kind of way. This is the first Ice Age movie that will be in 3D, which is an exciting aspect for children who have enjoyed similar animated features that required the special glasses to be viewed. As for the film’s content, it’s similar to the previous installments, though there are underlining lessons of the importance of sticking together as a family. There is also a strong female character, which may be of interest to fathers with daughters.